Are 49ers Determined to Draft a Quarterback With Top Pick? Even if the 49ers retain Colin Kaepernick, many NFL analysts believe the team may still draft a quarterback with its top pick, the seventh overall. 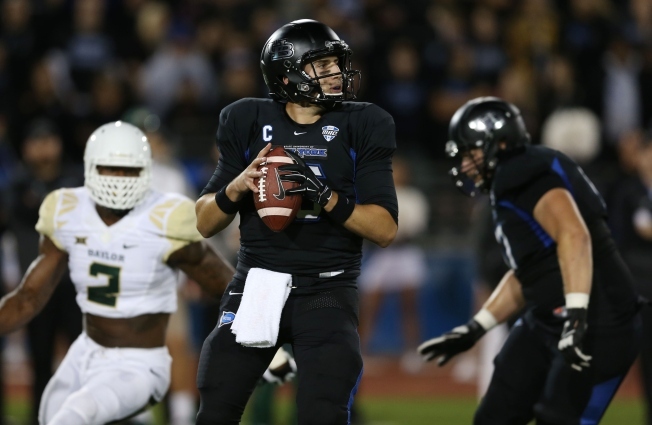 That certainly may turn out to be true if a player such as Cal’s Jared Goff is available. Draft analyst Rob Rang believes the Niners’ braintrust and head coach Chip Kelly may simply see too much potential in the former Golden Bear standout to pass on him if he's still available. But if Kaepernick joins the team’s offseason workout program in April and shows the 49ers he can fit into Kelly’s scheme, could the Niners afford to spend their No. 1 pick on a quarterback when they have so many other glaring holes to fill? Maybe not. Eric Branch of the San Francisco Chronicle this week wrote that it might make more sense for the 49ers to use their top pick on an impact defender at linebacker or the defensive line and take their chances later on a second-tier quarterback prospect. He points to the Raiders as an example of that strategy in 2014, when they took Khalil Mack with the No. 5 pick and then snagged Derek Carr high in the second round. If they do decide to use their top pick on another position, it appears the 49ers are doing their homework and searching for a possible diamond among quarterbacks who could be available in later rounds. Chris Trapasso of NFL.com reported recently that the 49ers have arranged a private workout with Buffalo quarterback Joe Licata. And this week, the 49ers looked in on the pro day of Michigan State quarterback Connor Cook – who also had caught the 49ers’ interest at the recent NFL Combine and was rumored to be a favorite of Baalke. Cook is a likely second-round pick while Licata is projected to go as late as the seventh round or be an undrafted free agent. It’s possible, too, that a top-tier prospect such as Paxton Lynch of Memphis could drop into the second round to the 49ers, or that Penn State’s Christian Hackenberg would be in the mix at the top of the second. Licata, 6-foot-2 and 215 pounds, certainly would seem to be a reach if taken anywhere from the second to fourth rounds. His numbers as a senior weren’t outstanding (16 touchdown throws vs. 15 interceptions) and his mobility may be questionable – a drawback in Kelly’s spread offense. But, as SB nation reported, Licata is Buffalo’s all-time leader in several passing categories, was a three-year starter, has big hands and completed 61 percent of his throws. And, in an interview last month with NFL Draft Blitz, Licata sounded like a confident player eager to show NFL teams he’s ready for pro football.